The Jungheinrich EZS 570 forklift is a versatile, economic tow tractor for towing loads up to 15,400 lbs. The ability to connect several trailers together helps to provide flexibility and increased efficiency in most material handling operations. Higher efficiency with excellent energy consumption. Powerful acceleration of the forklift. High top speed, even when loaded. No carbon brushes – the drive motor is maintenance free. 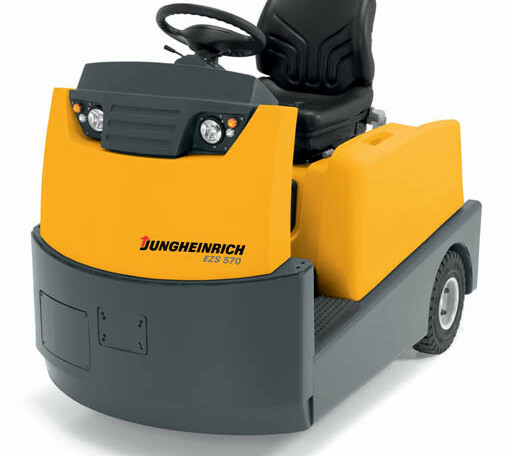 The forklift travel speed set by the position of the accelerator is automatically maintained regardless of gradient. Three programmable forklift performance modes to suit various applications. Regenerative braking returns energy to the lift truck's battery during deceleration. 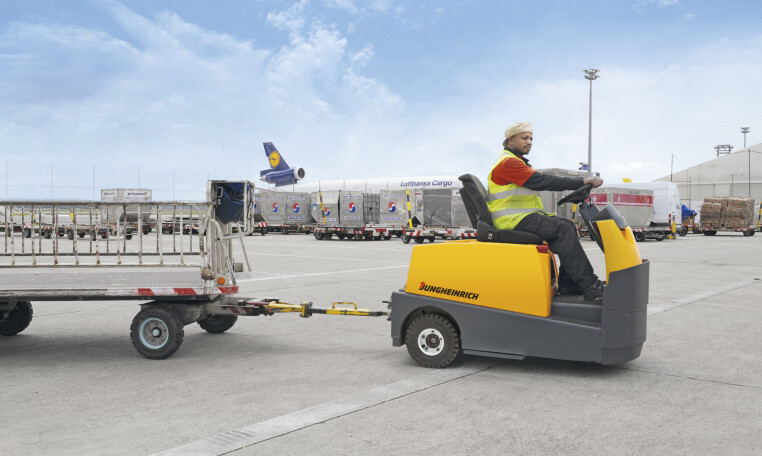 Secure starting and stopping, even on slopes, with the electric parking brake, which automatically engages when the forklift is stationary and automatically releases when starting. Crawl speed button for traveling at reduced speed. Low step for effortless entry and exit from the forklift. Close proximity of operator position to trailer and load. Highly visible and accessible coupling. Multiple storage areas for the operator. Lift truck chassis made of high-quality 0.31 inch thick steel plate. Extra high bumper on the front end. Robust, high intensity, LED (light emitting diode) rear lights and indicators. Battery discharge indicator, operation hours, travel speed and fault diagnostics. Fast, easy connecting/disconnecting of trailers with semi-automatic remote unlocking from the operator position. Inching controls for simple coupling connect and disconnect. Non-marking, solid pneumatic lift truck tires. PIN (personal identification number) activation of the forklift. Supplementary chassis protection made from steel. Holder for RF data communications components. Forklift cab with a variety of accessories for traveling outside warehouses. Energy efficient AC technology and high battery capacity, together with regenerative braking, allow the lift truck to operate longer - up to two shifts on one battery charge.